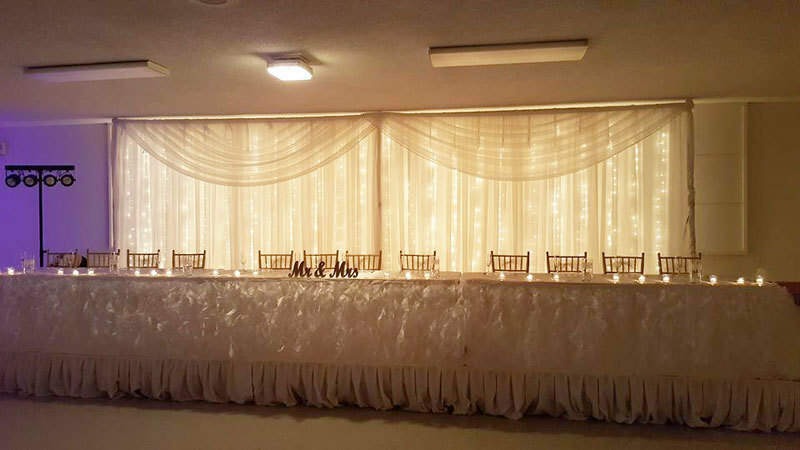 Sheer lighted backdrop rental - Price shown is per section and includes setup & tear down. Minimum Rental - 2 Sections. Draperies come in white, ivory, black, grey, navy, and blush. Top swags only included for white, ivory, and black sheer backdrops. Mileage and travel time may apply outside the Des Moines area. Note: The photo pictured is for "2" 12' sections. Would cover "2" 8' rectangle tables. Call for pricing! Sorry this item cannot be shipped!